Please Stay – Hello Korea ! Today on the roof, two Korean smokers, one Korean adoptee smoker, and one Seven Star were huddled at the top of the stairs (Nine Stones uncomfortable because he’s technically standing IN the building) smoking, smoking, and inhaling second hand smoke, as torrential 45 degree monsoon rains pelted them despite the canopy overhead. Y informed me that Seven Star wants me to stay in Korea and has decided to be my agent. He is going to get me a job in Gangnam, where I will make 5 thousand won a month. You mean 5 million won a month, Y informed him. That’s right, 5 thousand he says. Somehow Seven Star is pushed out into the rain, and he turns to me and tells me the rain is acid. Y says that if I let my hair get wet, then it will all fall out like Seven Star’s. She is always poking fun at people. She’s actually very mean! You can tell she pushes the envelope, just by the look on people’s faces…but it doesn’t matter with Seven Star, because he thinks all her mean comments are hilarious. Soaked, we ran downstairs and into Seven Star’s office, which is actually the large empty class where I am not allowed to teach, but which will maybe become the English Zone next year. I told him that it was not his office, but my English zone. He thought this was hilarious. I told him sorry, but it was mine, and I was going to paint the walls yellow. The other teachers all doubled up in laughter. (I don’t know why – is yellow funny? Oh – wait, maybe it’s because I think I can actually paint it…) There was a big slate map of Korea resting against the wall, and Seven Star points at it with his big naked toe. Y asks him if he teaches that way, pointing with his ugly feet. He continues to give us a geography lesson, pointing with his naked big toe and rubbing his feet all over Korea. 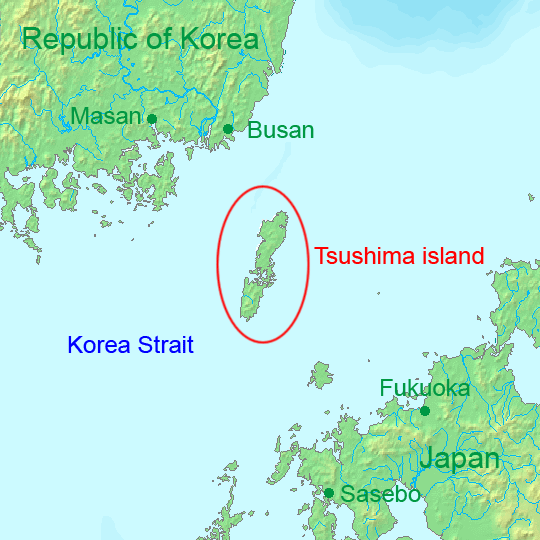 The funny thing is that Tsushima is definitely a Japanese territory, but a large percentage of its revenues come from Korean tourists who hold onto Syngman Rhee’s claim on Tsushima, so they like to visit what they think should be theirs. The trip will be directly following the end of summer camp (the school is open for two weeks in the summer, and many of the teachers have to teach and many of the students’s parents make them go) and will cost about 200,000 won. I guess Seven Star is famous for making his historical tours and running historical commentary, while making everyone do ridiculous things to save a buck. So the round trip ferry ride alone costs over 100,000 won. That with two nights accommodations, travel and food expensives, 200,000 is really frugal. But, with back bills and birth family searches to save for and Korean lessons, I don’t think I’ll have enough money. That’s okay, Seven Star says – he is rich and will lend the money – with a very low interest rate. (just joking) Young-a tells me to take the money and then leave the country.